Bronzini, before the start of the race is tense, quiet, and offers only an occasional smile. The traveling fans of the Squadra Azzurra yell her name but only manage to gain the attention of her teammates. They perform the duties of conversing with the traveling tifosi so that Bronzini can stay focused on the race and most importantly her rival Marianne Vos. 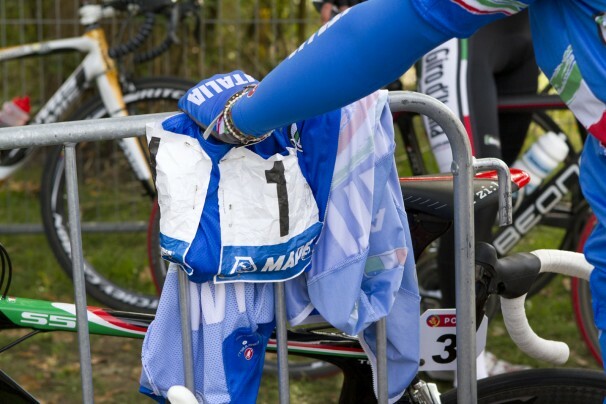 The current World Champion, wearing the Italian national jersey, quickly disrobes 10 minutes before the start of the race to take one last “natural break.” Her teammates guard the jersey, casually draped on the barricades. Race number ONE is pinned on her jersey letting the fans and her rivals know of last year’s achievement. It is the first time she has not worn the La Maglia Iridata for 12 months. This Copenhagen course is not bad for her but even she believes that it is even more suited to Marianne Vos whose season has been made up of weekly victories and stunning tactics. In the shade there is a slight chill in the Copenhagen air. What is a warm autumn day for the Danish is a cool one for the Italians. Bronzini, with goosebumps, her duties done, slips back on her racing jersey and rides to the bottom of the start line. The team, alongside her, measures the grade to the finish one more time. They take it at tempo, only occasionally standing on their pedals so as to feel their legs.